Create something to show for your weekend! 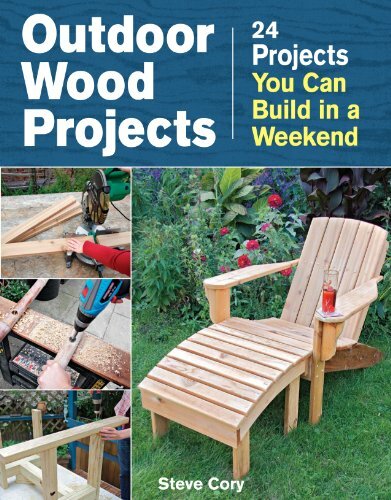 If you’re looking for projects that you can start and finish in just a weekend’s time, look no further than Outdoor Wood Projects. This collection of 24 projects for the backyard and garden can be completed with basic DIY tooling, inexpensive materials, and beginner skills. Perfect for basic woodworkers and just right for anyone more experienced who wants a “filler” project. Special sections and good ideas. Outdoor Wood Projects includes a whole chapter devoted to projects built with bamboo. And a number of the projects are constructed from reclaimed or recycled wood (such as an Adirondack chair made from wood pallets). We make it easy to get the project done! Easy-to-follow directions, photos, and illustrations take you step by step through each project. And materials, tools, and techniques are covered so you can enjoy a successful weekend.